Decks always look great the first couple of months after they are built, but before too long they start to require maintenance. Pretty soon, it seems like every other weekend is spent working on the deck and not enjoying it. SmartDeck solves that problem. 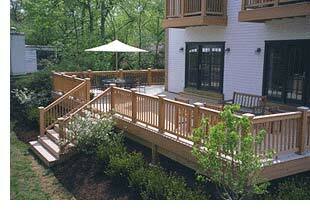 SmartDeck is a residential decking system designed with the homeowner in mind. Just as window and siding industries have evolved with synthetic materials, SmartDeck systems have taken decking to the next generation. Built around moisture resistant composite lumber, SmartDeck systems are more durable than natural lumber, and won't rot, split or splinter, so you can enjoy the warmth of natural wood without the maintenance. With SmartDeck, you are not going out on a limb... SmartDeck is a division of U.S. Plastic Lumber, Ltd., an innovator in plastic recycling for over 15 years, and the leader in synthetic lumber products. SmartDeck is an advanced composite of wood fiber and polymer. It combines the warmth of wood with exceptional design detail, durability and low maintenance. The railings, the only system of its kind made from composite lumber, are approximately 2/3 oak fiber, combined with 1/3 plastic that results in very strong, highly detailed lumber materials that have a wood tone appearance. The 5/4 x 6 SmartDeck deck board is a 50/50 composite of wood and plastic that provides exceptional durability and ease of installation. Very moisture resistant, this material will not rot, splinter or show other modes of failure typically resulting from the effect of moisture on natural wood. Over time, SmartDeck turns a light, silver, resembling the weathered appearance of natural wood. SmartDeck is backed by a 10 year limited warranty. SmartDeck provides excellent quality and value, while demonstrating a commitment to conservancy as it contains over 90% recycled and recovered materials by weight. U.S. Plastic Lumber, 2300 Glades Road, Suite 440W, Boca Raton, FL 33431. Tel: 561-394-3511; Fax: 561-394-5335.